Much before Bollywood actor Akshay Kumar made Indian women realize the importance of sanitary pads, by playing the role of Arunachalam Muruganantham, a social activist from Tamil Nadu who introduced low-cost sanitary pads, in the movie Padman. How does the rural population of a state like Bihar receive the idea of getting their women to use a sanitary napkin? Mostly it is not well received. Because they do not understand the importance of menstrual hygiene. When we hold sessions in various villages to educate them on the menstrual cycle and how to keep themselves hygienic during periods, a few of the women in the session pass comments at us such as ‘besharam’... ‘madam, AAP ganda baat kar Rahe ho…’ On the other hand, men complain that we are adding to the expense of the household. To be able to make them sit in the sessions, we use free breakfast as the bait. Of course, there are some women who understand the importance of what we say and they try to prompt others to listen to us. Why did you want to start such an initiative? Tell us about your journey. As a child, I always saw my father serving people. He was a doctor and conducted a lot of activities for those in the slums. I too was a part of those activities. I would sometimes visit the slum kids with free medicines. If I brought home some child who needed a health check-up or medicines, my father would offer his services for free. I carry his genes. My interest was in health and that made me study Master’s in Environmental Science but I did not work anywhere. Finally in 2012, after settling into my marriage and a family, I thought it was high time I did something. So, I designed a Basic Literacy Course for the kids in the slums. Soon after my friend Pallavi Sinha joined me as the co-founder of the initiative. During the course, we realized it was necessary to educate the women because if the mother is literate, the children will benefit more. So, our basic literacy course now included both children and women. While working with the women, we realized most of them faced health issues and menstrual hygiene was prominent amongst them. In fact, the majority of the health problems the women faced were because of not using proper napkins during the menstrual cycle. They used dirty cloth. That is when we turned our focus from literacy to menstrual literacy. Why do you think so many women suffer from menstrual health problem? Is it because they don’t have access to sanitary napkin? Having an access to the pads comes second in the complete picture. The primary reason for women facing certain health conditions is because of the lack of awareness regarding one’s menstrual cycle. Those in the rural area are unaware of the basics of menstruation - what, why, how, how to remain clean while menstruating...that is the real problem. If they understand the basics, they will themselves want to use sanitary napkins. 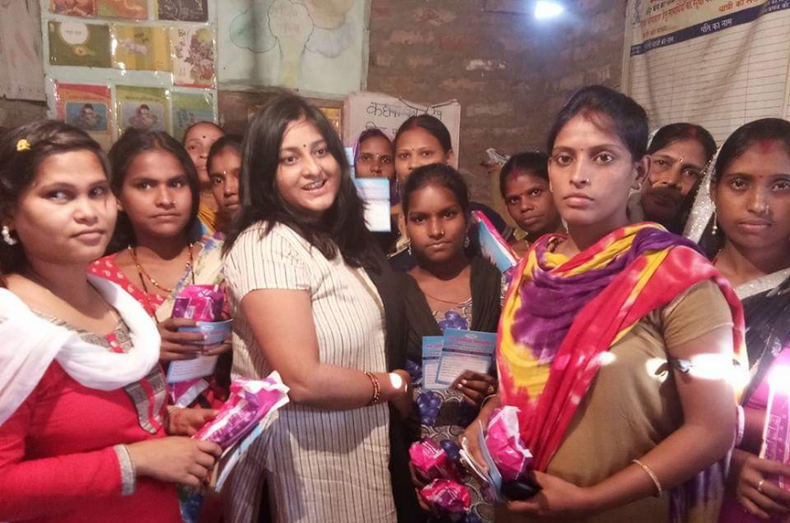 What does the Nav Astitva Foundation do for menstrual health of the underprivileged women? When we had started, Red Cross Society gave Unicef’s free sterilized sanitary napkins which we distributed amongst these women. Soon after, we went to visit the women and realized most of them hadn’t made the correct use of the napkins. That was disappointing. Again, In 2017, we initiated a campaign ‘Swachch Betiya Swachch Samaaj’ under which we established a sanitary bank for underprivileged girls and women. The sanitary bank issues pads to the women at a price of Rs 20 for each pack and the record is maintained in the passbook issued against the woman. The passbook record helps us know if the concerned woman is using the napkins or not. If she is not buying more pads, it means she is pregnant. And often it could be an unwanted pregnancy. We also educate them about sexual health. Young girls establish a physical relationship with men and to avoid pregnancy they consume tablets which are harmful to their health...there are a lot of such issues and we educate them about all of these as well. Why do you charge for the sanitary napkins, considering it is for the poor and they may find it unable to afford? For several reasons. One is that they don’t value it as they would value something they paid a price for. The money that we get from selling these napkins is used to keep the cause going, in paying the salary to the supervisor of the village who helps in arranging awareness sessions and other activities. (We raise separate funds for other activities like traveling to remote areas, etc). Second is that while they do come from a marginal economic section, Rs 20 for a pack of 6-7 pads is something that they can afford. When I meet them, I realize they like visiting the local village haat and spending money on bindi, chudi, Alta a considerable amount of some Rs 100. Spending on buying a pad seems like a difficulty to them. Having said that, we are working towards reducing the price to Rs 18. Are there any future plans that the foundation has for a better menstrual health ecosystem? We have already expanded to the urban area as well. In 2018, a sanitary napkin vending machine was installed at the Patna railway station. Also at the airport. We are basically trying to address all the problems associated with menstrual health. Various women reach out to me pointing out the concerns, and we take them up. Plans are afoot for installation of a vending machine at one of the petrol pumps at a highway on the way to Jamui. We also address seminars to the urban girls. These talks include women related issues such as sexual health, menstrual cycle, etc.